The Aetna is something of a curiosity: a didactic poem on the nature and causes of volcanic activity. In antiquity it was ascribed by some to Virgil; modern scholars reject this and, although unable to agree upon a date, favour the first century A.D. The text itself presents many problems in reading and interpretation, arising partly from corruptions in the manuscripts, partly from obscurities in the subject-matter. These difficulties are increased by the nature of the author's style: it is terse and elliptical, and at the same time loaded with scientific detail and mythological allusion. 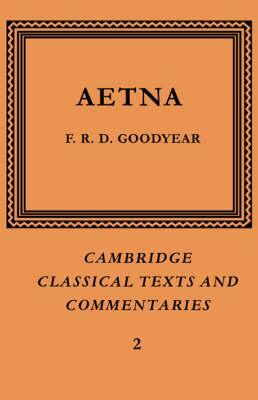 Dr Goodyear's edition provides a long introduction, a text with critical apparatus, a commentary, bibliography and indexes. The text is more reliable than any published hitherto.